The reflections in the water of the Bonsecours Market in Old Montreal, Quebec in Canada are beautiful in the lighting at dusk. 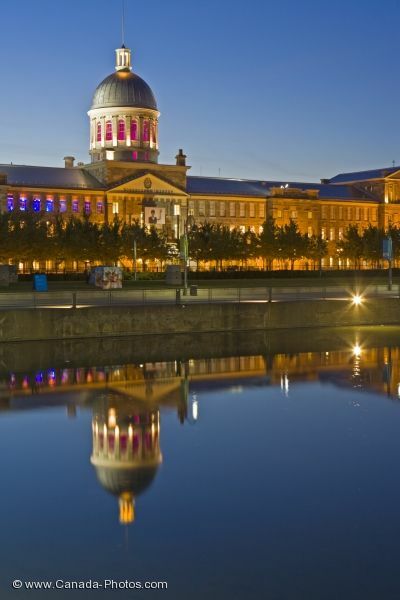 An important heritage building home to the Bonsecours Market in Old Montreal in Quebec, Canada, shows off its beautiful reflections across the surface of the water during the hours at dusk. The lights on the Bonsecours Market become very noticeable at dusk and many couples find this a beautiful place for a romantic stroll. During the day, the Bonsecours Market is busy as people come here to enjoy a meal, browse the boutiques, tour the galleries or admire the exhibits. More than 11 million people visit the market on a yearly basis. Bonsecours Market, Marche Bonsecours seen from the Bonsecours Basin at night in Old Montreal and Old Port, Montreal city, Quebec, Canada. Picture of the Bonsecours Market and its reflections at dusk in Old Montreal, Quebec.